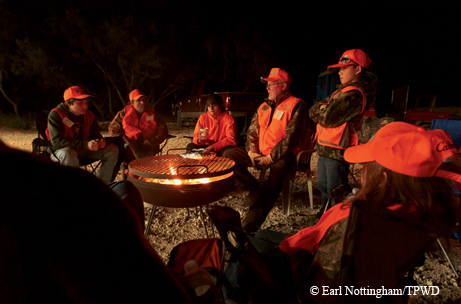 ﻿Six young hunters and their dads spend an unforgettable weekend hunting in the Hill Country. ﻿﻿Our family knows the place as Dobbs Run. It is a 5,100-acre patch of hardscrabble that sits at the western edge of the Hill Country on the Kinney/Edwards county line. Bisected by the West Nueces River bottom, the ranch has the kind of steep, dissected canyons, extensive oak-juniper woodlands and limestone hills characteristic of this part of Southwest Texas. Unlike some of our hardier neighbors, our family long ago quit worrying about chasing sheep, goats and cattle around those unforgiving hills. As the land can attest, previous stockmen — including a pioneering Hill Country ranch-woman named Isabella McKerrow and a transplanted Englishman named Hillcoat, who is credited with introducing sheep into Edwards County — attempted plenty of that. How Dobbs Run got its name remains the subject of friendly debate. Local lore has it that an early settler named Dobbs was plowing a field along a river terrace when a marauding band of Comanches up from Mexico attempted an ambush. Before the Indian raiders could get a jump on him, Dobbs’ alert wife yelled out to him, “Run, Dobbs, run!” thereby saving him from certain demise. When pushed, I’ll share the less colorful, and arguably less apocryphal, explanation. Way back when, the ranch sat along a stagecoach line that ran north from Fort Clark up the West Nueces. The stagecoach stops were called “runs” and were frequently named after the individuals who resided there. Historical records vouch for a settler named Dobbs who called the place home in the 1800s. Historians, albeit not this one, will tell you that the name likely has its origins in the old stagecoach stop and not in a failed Indian raid. ﻿Alex Roush beams from her blind after a successful morning's hunt. Today, wildlife is the undisputed king at Dobbs Run, and our family spends an inordinate amount of time chronicling its comings and goings. Deer and turkeys are counted and re-counted, as are Montezuma quail, golden-cheeked warblers, black-capped vireos, Texas snowbells and just about every other species of plant and animal that takes refuge there. And, just like our neighbors, we spend a lot of time fretting about too many hogs and too little rain. What we also do quite a bit at Dobbs Run is hunt. The fall and winter months are particularly sacred times. Family and friends gather en masse to muse incessantly about moon phases, rutting periods, mast crops, cold fronts, wind speeds, peak movement times and the other idiosyncratic preoccupations of Hill Country hunters. Such was the setting on a crisp November weekend last year, when we hosted a group of six young, eager hunters and their watchful fathers who had come to Dobbs Run courtesy of the Texas Youth Hunting Program (TYHP). 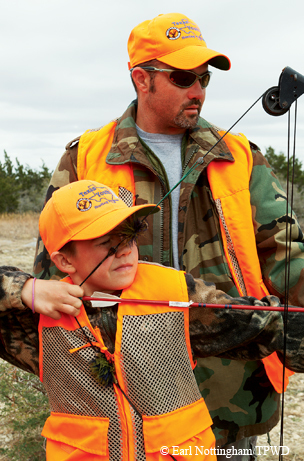 TYHP, which was created as a partnership between the Texas Wildlife Association and the Texas Parks and Wildlife Department, facilitates mentored parent-child hunts for new and beginning youth hunters on private lands. The goal is to expose kids in a safe environment to all elements of hunting — from “field to fork,” as one TYHP leader described it. 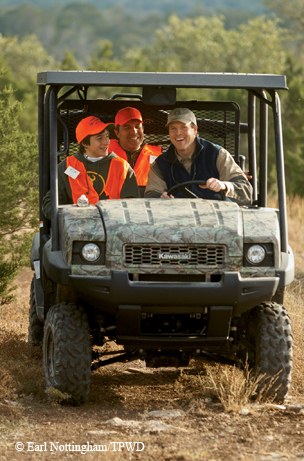 ﻿﻿Zachary and Todd Bishop enjoy the ride to their blind with Carter Smith. Now in its 17th year, TYHP pairs the hunters with willing landowners and teams of trained volunteer “huntmasters,” who lead the youth hunts and serve as the instructors, mentors, safety officers, guides and camp cooks. 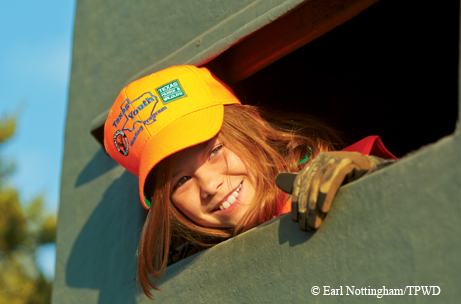 To date, thousands of kids, more than half of whom had never hunted before, have participated in the program. Four boys and two girls, ranging in age from 10 to 16, came out. Mom had made a special request for girl participants, pressing her case to TYHP leaders. To no one in the family’s surprise, she prevailed. The kids came from towns big and small, from parts as far away as Keller and Hallettsville and as close as Boerne and San Antonio. Some, like Jaydn from Jarrell, clearly knew their way around a deer rifle. Others, like Alex from Spring Branch, had never been on a deer hunt before. As they pulled into the ranch, the kids were all wide eyes, big grins and anticipation. After setting up camp under a grove of trees near the barn, the eager hunters and their fathers gathered at the ranch house for dinner. Over deer sausage and homemade cookies and ice cream, the families and huntmasters got to know one another, and Mom and Dad shared a short history of the ranch. Dad also sprung the news that the kids would be entitled to harvest one white-tailed buck or doe of their choosing, an axis buck or doe and unlimited feral hogs over the weekend. The kids’ eyes lit up like Christmas trees. Lead huntmaster Doug DuBois patiently explained that a safety orientation was in order first, standard fare for all TYHP hunts. Over a roaring campfire, DuBois and his team laid out the expectations for the weekend’s hunt. Safety considerations would be paramount, the land and the game would be respected, no one would pull a trigger without fully identifying the target, all hunting laws would be obeyed, and, most of all, everyone would have a good time. ﻿﻿Over a campfire, huntmaster Doug DuBois lays out expectations for the weekend’s hunt. It’s the latter point that DuBois, a veteran huntmaster of 12 years, emphasizes as an essential part of the TYHP experience. He also never fails to remind the kids of a well-honed TYHP axiom that they will learn to appreciate even more with the passage of time: “Always remember, the weekend is the reward. The harvest is the bonus,” he offers wisely. DuBois, a lifelong sportsman, conservationist and member of the Texas Wildlife Association board, is one of the 1,000 or so volunteers who make TYHP work. Some, like John and Gentry Thomas and Eric and Zach Goike, who all assisted on this hunt, are father-son teams who enjoy passing on to other families the outdoor traditions and values they cherish. Others, like Jim Cranmer, participate in TYHP because the experience reminds them of why and how they became hunters. The next morning, the coffee was made, breakfast was ready and the campfire was roaring by 5 a.m. as the bright-eyed and bushy-tailed young hunters gathered to find their guides. According to the fathers, sleep had been a rather illusory proposition as the kids tossed and turned all night, anxious for the morning hunt to begin. When the hunters returned to camp, it was clear that the morning hunt did not disappoint. All the kids saw game, including Alex, who was also treated to a bobcat sighting. Several had gotten shots at deer. Some had seen bucks sparring with each other. Jehrid harvested a dandy buck, and young Wyatt connected on his first deer, a great buck with mule-deer-like split G2 antlers on both beams, an anomaly on a white-tailed deer. They all loved riding around the pastures in the old Willys jeep and ranch mules, seeing new country and listening to tall tales from the colorful ranch guides, Lance Tompkins and Bryan Fisher. After the field-dressing, picture-taking and story-telling were over, the hunters gobbled down a delicious camp lunch deftly prepared by the Goikes. They were then rewarded with the arrival of TPWD Game Wardens Rob Frets and Scott Holly, who shared information about wildlife, hunting laws, conservation and careers as state game wardens. A big part of the TYHP experience is ensuring that the young hunters learn about hunting ethics and the critical role that hunters play in conserving wildlife for future generations. Just as importantly, the kids are introduced to the role that private landowners take on as stewards. To that end, Mom and Dad led the kids on a walk through the house pasture, discussing the importance of habitat management practices such as using prescribed fire. They identified various species of plants and explained the value of the plants in providing food, cover, water and shelter to the abundant wildlife that call the ranch home. ﻿﻿Wyatt Wood demonstrates his new archery skills for his dad, Charles. A short trip to the rifle and archery ranges gave the kids another opportunity to learn from the huntmasters about the importance of good marksmanship, proper firearm handling and hunter safety. Then, it was off for another hunt in the hills. Later that night, after a delicious meal of brisket, beans and homemade cobbler, everyone gathered under the stars for one of the program’s signature experiences, the campfire talk. It is at this point of the weekend that the true magic of the Texas Youth Hunting Program fully emerges. The youth hunters, fathers, landowners, guides and huntmasters are asked to reflect in their own words on what the weekend’s experience has meant to them. It is an intensely personal moment, and for many, the emotion is both palpable and poignant. Madison, one of the two girl hunters on the trip, reflected thoughtfully on how meaningful it was to spend such uninterrupted quality time with her father in the deer pasture. As his dad looked on proudly, young Wyatt, who was on his very first deer hunt at age 10, recounted the story of taking his first buck that very morning. The final morning hunt proved to be a fruitful one. Young Alex came back to camp sporting an ear-to-ear grin. In the back of the jeep was the fat axis doe she had harvested, her first ever. Zach popped a nice feral hog, earning him high-fives from the other hunters and a special word of thanks from my father. Jehrid and Jaydn each connected on nice axis bucks, firsts for them. Madison and Wyatt had seen ample game and were content to revel in the success of their fellow hunters. But, as the young hunters quickly learned, the “hunt” was not over. Alas, hunting trips involve chores and work, and the kids needed to experience that as well. Camp had to be broken, ranch vehicles cleaned and washed out, game skinned and quartered and put on ice, trash hauled off and trucks loaded and packed for the trip home. As the hunters gathered for a quick lunch, a short wrap-up from the huntmasters, a group picture and a final round of goodbyes, we all exchanged e-mails and phone numbers and pledged to stay in touch with the many new friends we had made over the weekend. As usual, Mom said it best when she turned to DuBois and posed the question on all of our minds: “When can we do it again?” The TYHP had worked its magic on all of us, one more time.